There are six major classes of nutrients found in food: carbohydrates , proteins , lipids (fats and oils), vitamins (both fat-soluble and water-soluble ), minerals , and water. These six nutrients can be further categorized into three basic functional groups. Carbohydrates come in a variety of sizes. The smallest carbohydrates are the simple sugars, also known as monosaccharides and disaccharides, meaning that they are made up of one or two sugar molecules . The best known simple sugar is table sugar, which is also known as sucrose , a disaccharide. Other simple sugars include the monosaccharides glucose and fructose, which are found in fruits, and the disaccharides, which include sucrose, lactose (found in milk), and maltose (in beer and malt liquors). The larger carbohydrates are made up of these smaller simple sugars and are known as polysaccharides (many sugar molecules) or complex carbohydrates. These are usually made up of many linked glucose molecules, though, unlike simple sugars, they do not have a sweet taste. Examples of foods high in complex carbohydrates include potatoes, beans, and vegetables. Another type of complex carbohydrate is dietary fiber . However, although fiber is a complex carbohydrate made up of linked sugar molecules, the body cannot break apart the sugar linkages and, unlike other complex carbohydrates, it passes through the body with minimal changes. 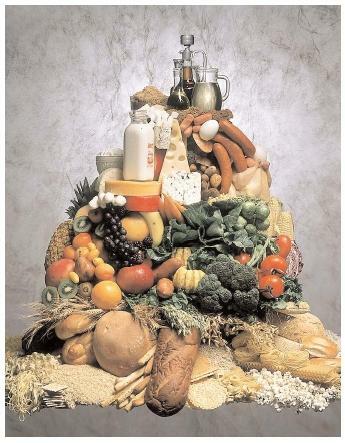 The Food Guide Pyramid groups foods together based on their nutrient content. In theory, a diet designed around the pyramid will include all the essential nutrients that the body needs to thrive. in the body (whereas carbohydrates are the body's major energy source), and are also the major form of fat in foods. The energy contained in a gram of lipids is more than twice the amount in carbohydrates and protein, with an average of 9 kcal/g. Lipids can be broken down into two types, saturated and unsaturated, based on the chemical structure of their longest, and therefore dominant, fatty acid. Whether a lipid is solid or liquid at room temperature largely depends on its property of being saturated or unsaturated. Lipids from plant sources are largely unsaturated, and therefore liquid at room temperature. Lipids that are derived from animals contain a higher amount of saturated fats, and they are therefore solid at room temperature. An exception to this rule is fish, which, for the most part, contain unsaturated fat. The important difference between saturated and unsaturated fatty acids is that saturated fatty acids are the most important factor that can increase a person's cholesterol level. An increased cholesterol level may eventually result in the clogging of blood arteries and, ultimately, heart disease . Vitamins are chemical compounds that are required for normal growth and metabolism . Some vitamins are essential for a number of metabolic reactions that result in the release of energy from carbohydrates, fats, and proteins. There are thirteen vitamins, which may be divided into two groups: the four fat-soluble vitamins (vitamins A, D, E, and K) and the nine water-soluble vitamins (the B vitamins and vitamin C). These two groups are dissimilar in many ways. First of all, cooking or heating destroys the water-soluble vitamins much more readily than the fat-soluble vitamins. On the other hand, fat-soluble vitamins are much less readily excreted from the body, compared to water-soluble vitamins, and can therefore accumulate to excessive, and possibly toxic, levels. This means, of course, that levels of water-soluble vitamins in the body can become depleted more quickly, leading to a vitamin deficiency if those nutrients are not replaced regularly. Deficiencies of vitamins may result from inadequate intake, as well as from factors unrelated to supply. For instance, vitamin K and biotin are both produced by bacteria that live within the intestines , and a person can become deficient if these bacteria are removed by antibiotics . Other factors that may result in a vitamin deficiency include disease, pregnancy, drug interactions, and newborn development (newborns lack the intestinal bacteria that create certain vitamins, such as biotin and vitamin K). There are many minerals found within the human body, but of the sixteen (or possibly more) essential minerals, the amount required on a daily basis varies enormously. This is why minerals are subdivided into two classes: macrominerals and microminerals. Macrominerals include those that are needed in high quantities, ranging from milligrams to grams. Calcium , phosphorous, and magnesium are macrominerals. Microminerals are those necessary in smaller quantities, generally between a microgram and a milligram. Examples of microminerals include copper, chromium, and selenium. Dietary requirements for some minerals have yet to be established. SEE ALSO Carbohydrates ; Fats ; Kwashiorkor ; Marasmus ; Minerals ; Nutritional Deficiency ; Protein ; Vitamins, Fat-Soluble ; Vitamins, Water-Soluble ; Water .